A sound installation and an innovative music instrument played by wind and a kite winder. I am always afraid of losing control. I want everything to be perfect — and that has been my constant struggle and my source of anxiety. To letting go control is a life lesson I never stop learning. I find the experience of flying kite speaks to me a lot. The interdependent rivalry relationship between wind and the kite flyer is a beautiful resembling to the relationship between ourselves and the invisible power around us. Kites fly when wind and string work together, and we as human are always shaped both by our own will and external power. In both cases, we have to let go part of the control to not lose it completely. I Am in Control is a instrument to be co-played by me and wind, and a performance that tells a story about control and letting go control. The instrument is composed of a kite, a kite winder connected to the kite, and two fans. A rotary encoder on the kite winder triggers audio sample every time the performer pulls in or let out the kite string. Meanwhile, two fans create wind around the kite, allowing it to fly. It also triggers a granular synthesizer that chops and filters the audio sample according to the speed of the fan. The stronger the wind blows and the harsher I pull the kite string, the more chaotic the music would become. Wind is produced by a blower and 2 fans. Using an Arduino and a Midi AC Dimmer, the fan speed could be adjusted with a foot pedal as well as a remote control. 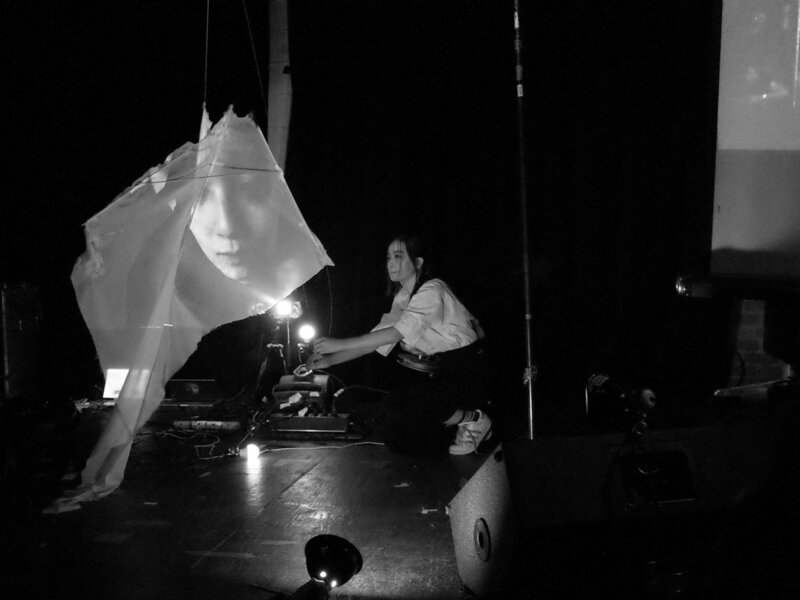 During the performance, a remote control is handed over to an audience to control the speed of the wind. A rotary encoder is made on the kite winder with Teensy and hall effect sensors to read my gesture of controlling the kite string. The kite is custom designed and fabricated with semi-transparent white fabric. A live view of my face while flying the kite is projected on the kite. As wind blows and kite travels, the face gets chopped and distorted.